As a cassandra sangue, or blood prophet, Meg Corbyn can see the future when her skin is cut - a gift that feels more like a curse. Meg's Controller keeps her enslaved so he can have full access to her visions. But when she escapes, the only safe place Meg can hide is at the Lakeside Courtyard - a business district operated by the Others. Shape-shifter Simon Wolfgard is reluctant to hire the stranger who inquires about the Human Liaison job. 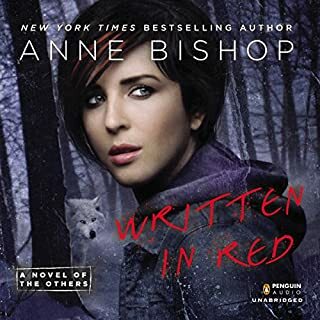 Anne Bishop delivers complex world-building in this series starter. Meg's clueless innocence and earnesty are engaging. She brought me onside pretty quickly. Look forward to seeing where this series goes. At 18 hours length it's a good value for a credit. Alexandra Harris' narration is good. No issues there. This story is sweet fluff, like marshmallow cream. You won't take any great meaning or life lesson away from it but it's enjoyable. I will definitely return to it when I need an escape. 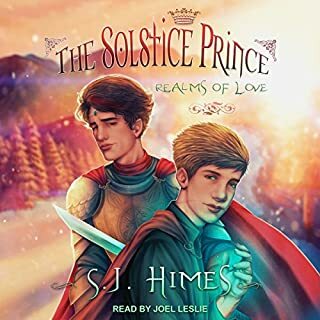 Joel Leslie is a talented narrator, but his British accent could use some work. 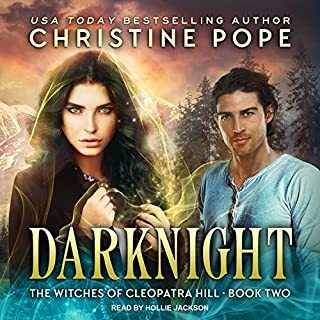 Kidnapped by a rival witch clan, Angela McAllister envisions a dark future for herself until she discovers her captor's brother is the unknown man who has haunted her dreams since she was a child. Forced to re-evaluate everything she's ever known about the Wilcox witches, Angela begins to explore the powerful connection that binds her to Connor Wilcox, despite the generations of hostility between their families and the disapproval of those closest to her. I read this ebook a while back. Revisiting the story in audio format seems to have magnified the flaws I was able to overlook the first time. This book is saddled with a hero and heroin who allow themselves to be managed by their families, even against their own wellbeing. Perhaps this is a consequence of the insular clan structures of their respective families but I found it difficult to engage with two such passive main characters. Connor demonstrates that he won't risk his own comfort or convenience to protect Angela from his brother and Angela accepts that as reasonable remarkably quickly. When Angela finally grows a spine and makes her own choices she is unreasonably shocked and dismayed to discover that her controlling family will push back. I found myself chastising the characters and couldn't finish the book this time. Hollie Jackson's narration was good. No issues there. I read this ebook a few months back and liked it well enough but it did not withstand the test of a repeat experience. 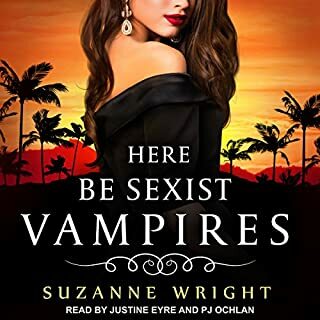 The Main character, Sam, sets herself up as some great bastion of feminine strength and idealism fighting the vampire patriarchy yet misses no opportunity to disparage the other women in the book. Nary a chapter goes by that she doesn't sneeringly compare herself to the hero's consort. The story had potential, but Sam's attitude toward other women killed it for me. Justine Eyre's voice work was quite good. However, P.J. Ochlan should stay far, far away from any roles involving a British accent. Ox was my favorite character simply because he is the prime mover of the story and is so wonderfully complex. There are many good secondary characters. The only fault I can find with characters is the villain werewolf. He was a very trite, two-dimensional character. What about Kirt Graves’s performance did you like? Kirt Graves performance is as close to perfect as it gets. He clearly understands Ox and really sank himself into the story. His ability to convey strong emotions in a flat tone through a character who seems very simple, but is quite complex is extraordinary. There were so many moving scenes in the story it is hard to pick just one. 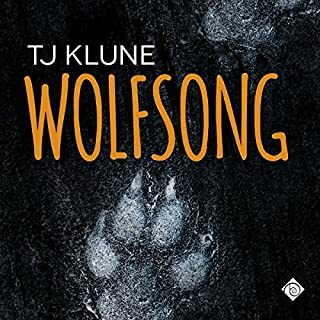 TJ Klune really knows how to wrench emotions. The Ankh-Morpork Post Office is running like...well, not at all like a government office. The mail is delivered promptly. Postmaster General Moist von Lipwig, former arch-swindler and confidence man, has exceeded all expectations - including his own. So it's somewhat disconcerting when Lord Vetinari summons Moist to the palace and asks, "Tell me, Mr. Lipwig, would you like to make some real money?" 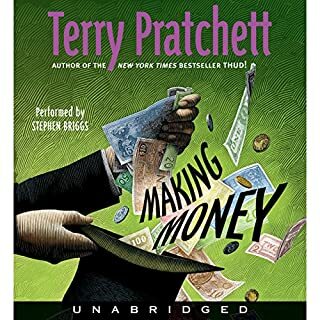 What made the experience of listening to Making Money: Discworld #36 the most enjoyable? As usual, Stephen Briggs brings the Discworld characters to life. Even though he has narrated many of Pratchett's books with many different characters he manages to give each character a distinct presence and makes them recognizable from one book to another. This is quite a feat when working with such an enormous cast of characters. Moist von Lipwig is one of my favorite Discworld characters. Just when you think he can't go any further out on the ledge he flings himself over. The transition music between chapters was very bizarre and distracting. It was quite out of place and pulled me out of the story. I had to re-immerse myself back into the story with each new chapter.